My favourite way to cleanse my face is definitely with a cream cleanser. I love the texture, the feel of the products on my skin and the way that my skin feels after I’ve used this type of product. I’ve tried a few cream cleansers and they’ve all been pretty good and done a similar thing but the one that I always go back to is the No7 Beautiful Skin Hot Cloth Cleanser. Nothing has ever come close to it for me, until now. Quite a few months ago, I purchased the Elemis Pro-Radiance Cream Cleanser back in May when I stayed over at a spa hotel for my wedding anniversary. It is a big cream cleanser, with a pump bottle that comes with a 100% cotton towelling facial mitt in the box. The Elemis Pro-Radiance Cream Cleanser is a facial cleanser that can be used to remove makeup from the skin and clean it as part of either your evening or morning cleanse, or both. It is suitable for all skin types and contains Great Burdock to help to balance the skin which is great for oily and problematic skin types and it feels moisturising on the skin which is great for drier skins. The Pro-Radiance line focuses on having anti ageing effect on the skin and this cleanser aims to deeply clean the skin, with the plan extracts within the formula, while also moisturising it to leave the complexion looking fresh and youthful which is definitely does. As part of its anti-ageing benefits, this cleanser contains Moringa Seed Peptide which helps to protect the skin from daily pollutants and Noni and Assai Fruit which contain a high level of anti-oxidants. It has a light herbal scent with active fragrances of Sweet Brazilian Orange, Lavender, Ylang Ylang and Patchouli within the formula which smell calming and relaxing. For that reason, I like to use this the most at night. It is so easy to use, simply massage a couple of pumps into the skin and allow it to sit on the skin to help to break up any makeup you’re wearing. Then, use the towelling cloth as a mitt, run it under touchably hot water, wring it out and then use the mitt in circular motions to wipe the cleanser and dirt off your face. I find that this cleanser removes the vast majority of my makeup with only one cleanse. I personally prefer to either use a micellar water or my Klorane eye makeup remover on a cotton pad to remove the surface makeup from my skin first and then follow up with this cream cleanser, or use the cream cleanser twice as when I only use it once as my only method of cleansing, I find that it doesn’t quite get all of my liquid liner off. This cream cleanser feels rich and creamy yet lightweight as it doesn’t overload the skin. It is easy to remove and doesn’t leave a film or residue on my skin. The scent is lightly noticeable but it doesn’t linger on the skin and the cleanser as a whole feels very gentle, soothing and moisturising. I really like using it as part of my daily cleansing routine and love that it works so well with my Magnitone Barefaced! facial cleansing brush (review here) which is my preferred tool to use with it. That being said, I do love the towelling mitt that comes with it as it is such good quality and very reminiscent of the mitts that they use during a facial at a spa which I have always wanted to be able to buy! 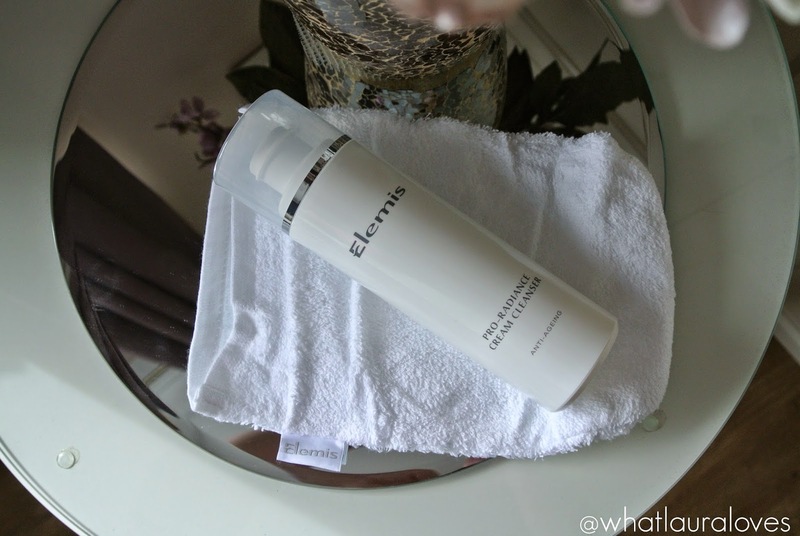 While I do absolutely love this cleanser, I don’t think I’ll be rushing out to buy it again just yet as it isn’t any better than my No7 Beautiful Skin Hot Cloth Cleanser which is quite a lot cheaper and does exactly the same thing. I would definitely recommend it though, especially if you love your higher end skincare with a light herbal fragrance. 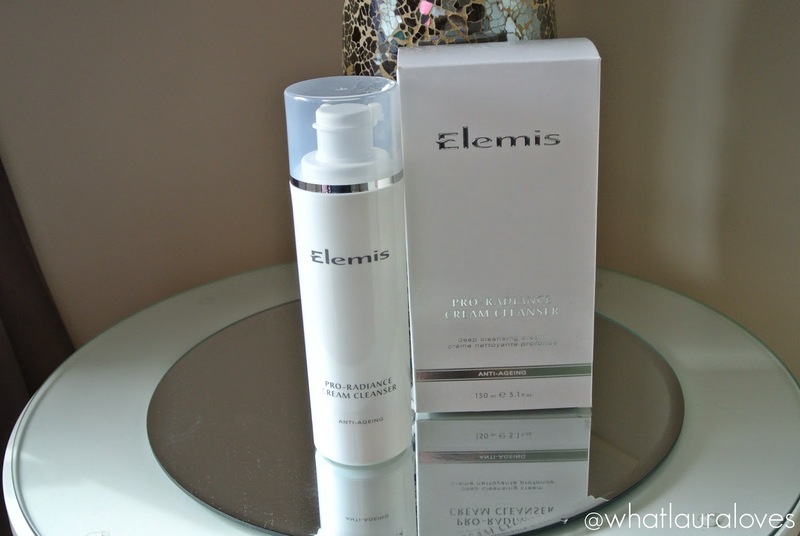 You can buy the Elemis Pro-Radiance Cream Cleanser here. What is your favourite cream cleanser? I love Elemis products. I know that it is a pricey product and you said you would not repurchase soon, I still want to try it. Lucky for me it is the holiday season so maybe I can get it for the holidays. Oh I have never tried a foam cleanser, I'll have to give this a go!